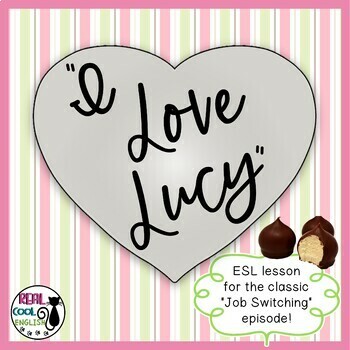 This ESL lesson based on the "I Love Lucy" Job Switching episode is a really fun way to give your students listening, speaking, vocabulary, and writing practice. I have done this lesson with my students many times, and it is always a huge hit! 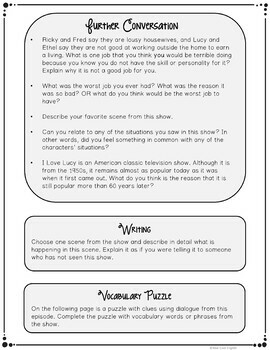 The episode is divided into scenes with language information and discussion questions. Pre-viewing discussion questions get students to start thinking about the topic, and post-viewing discussion questions go deeper into the topic and help students think more deeply about the topic and relate it to their own experience. 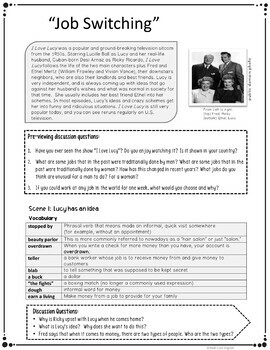 Students can do a crossword puzzle using dialogue from the episode as clues. A fun role-playing activity is included to practice pronunciation and build fluency.